This entry was posted in Foot Wear, Gear Reviews, Gear Stores, Socks and tagged Backpacking, Down Socks, GooseFeet Gear, Hiking, Overbooties, UltraLight Backpacking. Bookmark the permalink. I am interested in ordering a pair of goose down booties. From where? How much? Click on the link in the text above, it will take you to the site, which will have the prices listed. Hey Stick, I just got my socks and overbooties in the mail last week. I was immediately regretting the purchase because they seemed like too much of a luxury item for my AT thru hike. After sleeping outside in the snow where it got down to 23 degrees I am much more happier about this purchase. 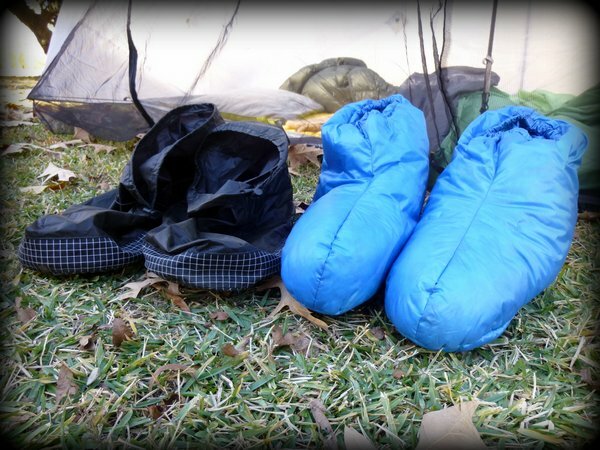 My feet felt great at night in my hammock and the overbooties were awesome for walking around in the snow. The ground was flat though, I wonder how they will be when it is unlevel. Also, how usefull will they be in the mud? Will I be annoyed to have to wash them so I can store them in my pack? We’ll see. Anyway, good luck on your thru, and hope the socks work out well for you throughout it! Thanks for this great review! It was really helpful. I was wondering, how do they fit? I noticed when you said you are a size 12 that you are at the top of the size range for the size that you got (Large = men’s sizes 9.5~12). I am also at the top of a size range, and was considering sizing up just in case. Are they really snug? Or do you have room for a pair of socks? If you do, can you only wear a thin pair, or could you fit a thick pair of socks? Thanks! They fit me comfortably. I can wear some super thick socks inside the down socks, and they do not make the fit feel tight, or cause any of the down to compress. However, I generally prefer to wear a thin pair of liner socks with them. Appreciate the recommendation. Will tryy it out. Wow I am really torn here – was ready to pull the trigger on these, but just having a hard time with the price – $137 (or $254 for 2) to my door! I then looked up FF and they are $119 ($208 for 2) to my door. I love my wife but that is a lot of change for a little bit of down. FF are 9.3oz w/ 4oz fill vs 4.6oz w/ 1.5oz of fill. You are actually the second person I have seen that has considered both of these booties in the last few days (the other was in a thread over on BPL, unless that was you too). To be completely honest, as far as the product itself, I have a strong feeling that you will be happy with whichever company that you decide to go with. FF is a well know, established company, and for good reasons. As well, Ben seems to also be the same, but maybe on a smaller scale than FF. All I can say is that I now have all 4 of the items that he lists on his site and I am happy with all of them. Anyway, let me know what you decide. And are you still considering a jacket from Ben? One thing I do is “pee” in a wide mouth flexible water bottle in my tent (make sure it doesn’t drip!) and the warm urine will keep you toasty! Why leave the tent in the middle of the night when you don’t have to??? 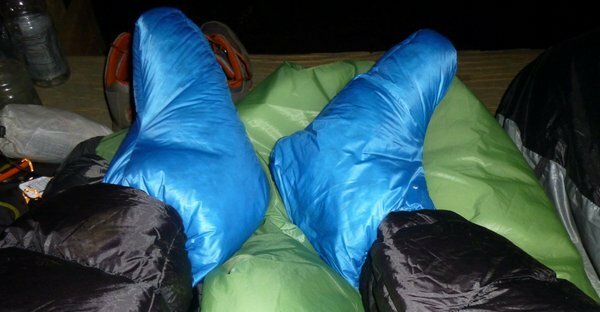 Also, I wrap stuff sacks on my feet and have NEVER had any issues with cold feet camping at 13K’ with below 30 degrees. I have a 30 degree Zpacks sleeping bag that I’m sure does help me stay warm! Yeah, that just really doesn’t work for us ladies. The booties are on my wishlist. Even in April in the High Sierras it can be 20F at night. I’d love some extra fluff for my feet. I saw the ones at REI (where I bought the fleece socks) and have looked at others online. They all have chunky soles. I think that for the most part, except for Goose Feet, they are all building something that is never intended to see a camping trip. Maybe a cabin, but likely watching TV. Yes, My wife and I have the REI down booties. They are perfect for cold evenings watching TV and wearing around the mountain lodge. I would not take them camping. However, I do love them for inside. Feathered Friends also makes a combo down sock with outer shell. They and Goose Feet are the only companies I know that make this form factory down booties. Eventually I will get either the FF or Goose Feet ones. Not too long ago I bought a pair of fleece socks that have been OK, but I so want a pair of Goose Feet. Next year’s budget. Just about the only thing wrong with my down bag is at the toes. I don’t know if it’s just thinner, gets more compressed, has more seams, or less down. Feet get cold and it seems to be everyone’s complaint. Back a long time ago when first married I bought my wife a pair of down socks (called booties back then). They may have been Kelty or North Face. Mostly self preservation. Talk about popsicle toes in bed. Brrrr. We separated, but I think she still has them. Something happened to that market. It seems like Goose Feet is the only current manufacturer, Everything else I’ve found has been solid soles. Would a couple of squiggles of silicone sealer on the over boot insole help? I’ve seen people do that with sleeping pads. As far as your suggestion, that may help some…I may have to try that and see how it does… Thanks for the suggestion!